The Grandview Woodland Food Connection and Britannia Community Centre are pleased to co-host the 8th Annual Corn Festival with the Canada El Salvador Action Network. This Festival is a popular event within the Latin American community here in Vancouver, celebrating the social, cultural,and political importance of corn to the people’s of Latin America. Increasingly, genetically modified corn, much of it imported from the US, is threatening the biodiversity of indigenous varieties and corn, the sovereignty of corn growers, and ultimately of food security in Latin America. In response, communities around Latin America are struggling to re-appropriate corn as a vital and healthy food crop and important cultural identifier. Join us on Sat. 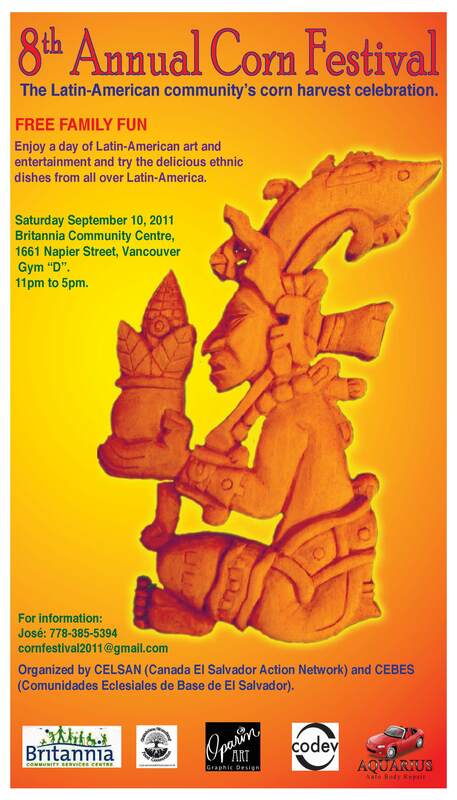 Sept 10th, 11 -5pm at Britannia Community Centre, Gym D for a wonderful fiesta celebrating corn in all its tasty forms. Share fun, music, song and food. This is an all ages Fiesta and all are welcome! Great Post! Thanks for posting this!